Understanding how to manage the Storyboard Pro interface helps you to work efficiently and organize your workspace conveniently. There are a many views and toolbars you can use for performing different operations. You will probably have your own preferred way of working in the Storyboard Pro interface as well. Located at the top of the Storyboard Pro interface, the top menu contains most of the commands. Depending on the view you are working in and the selected element, some commands are available and others not. The Tools toolbar contains the main tools you need to work in Storyboard Pro. In the default workspace, this toolbar located on the left-most side of the interface. A small triangle at the lower-right corner of a tool indicates that additional tools can be selected in a pop-up menu. To access these tools, either click and hold on the tool button, or select the tool then click on it again. 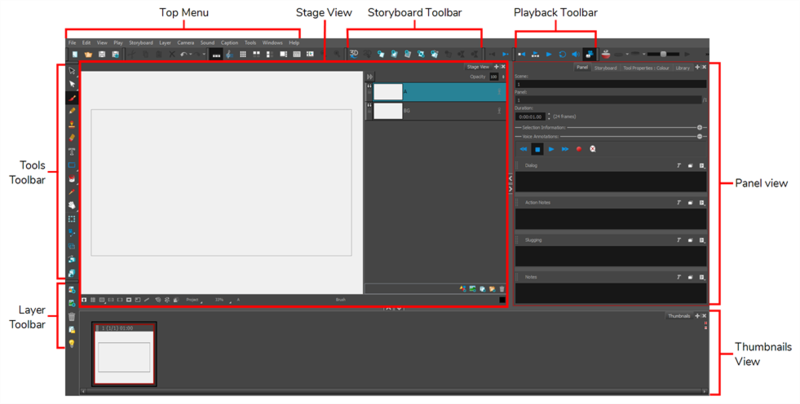 The Storyboard toolbar contains all of the basic commands related to adding and deleting panels, scenes, and transitions, as well as switching between the 2D and 3D workspaces. In the default workspace, this toolbar is located at the top of the interface. The Thumbnails View displays all the panels of your project in chronological order. You can use this view to navigate through your storyboard, rearrange panels and scenes, and select the panel to display in the Stage view. By default, it is not possible to draw in the Thumbnails view and there are no browsing buttons. But you can change these settings in the Preferences dialog box. The Stage view are the centre of operations in Storyboard Pro. In these views, you can build, draw, paint, animate the camera, create layers, and see your results. The Panel view displays the different captions related to the current panel, the in, out and duration, and lets you play any voice annotations related to the panel. NOTE By default, when you modify the workspace, it is automatically saved. You can restore the default workspaces by selecting Windows > Restore Default Workspace. You can prevent this behaviour by deselecting the Save Workspace option in the Preferences dialog box—see General Preferences.